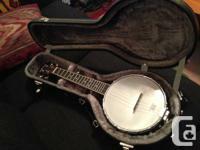 Selling my rare Weymann's model two tenor banjo. To say this banjo is beautiful is an understatement. I've seen many vintage instruments over the years but this is by far the prettiest!!! Made in the good old USA where the best of the best instruments where created. I believe this is the model two from the 1920s but feel free to correct me if I'm wrong.. This banjo not only looks good but plays wonderfully with amazing tone. The resonator is a stunning flame maple with birds eye maple on the neck. The neck has multiple wood laminates for that classy touch. The head appears to be skin but probably not original. The multi maple layered mega phonic ring really projects the tone very well and LOUD!! Classy touches include stunning pearloid binding throughout and half herringbone trim. Comes with its original hard shell case which is in amazing condition for its age.One of the metal claws needs to be reinserted. It's included in the case. I think the previous owner forgot to put it back after installing what looks like an ebony armrest. 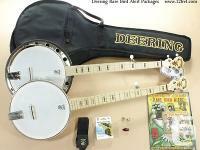 This an amazing banjo to play and enjoy and a great addition to any collection. The resonator fits loosely on the rim. Newer felt pads(pink color) were added but needs abit more padding to pressure fit on the resonator. The original?leather pads are included. 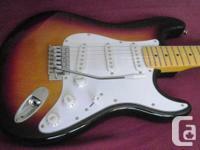 Try your offer on this rare beauty. 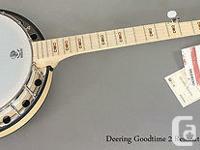 Price: $56,950 US$569.50 Deering Goodtime 2 resonator-banjo: Free Shipping!